My name is Alla and I have been teaching and tutoring in the area of mathematics for the past 21 years. I am a math teacher from CCPS and adjunct instructor for Chesapeake College. I have tutored in subjects such as remedial math, College Algebra, Trigonometry, Pre-Calculus, Statistics, Algebra, and Algebra 2 and prepared clients for GRE, SAT, Accuplacer and GMAT tests. I have experience tutoring students from 1st to 12th grade and college level. I have a MS in Electrical Engineering where I have taken up to Calculus 3, receiving A's in all math classes. I love to teach, and have a keen ability in finding what is hindering a student from moving forward. I teach by first seeing where the student is in their understanding, then try my best to fix the cracks in the foundation of the students understanding of mathematical concepts. I have found that most students have problems with higher math classes because they lack the understanding that is needed to enter the class. My hope is to help a student get to a place where they no longer need a math tutor to keep them from failing, but can have the confidence to move forward on their own, knowing they have the capability of getting an A. Let me explain my cancellation policy. If a student missed a session, he or she will be billed for 1 hour of my time. Call me in advance if you need to cancel, please. Needlework is a broad term for the handicrafts of decorative sewing and textile arts. Anything that uses a needle for construction can be called needlework. I can knit and crochet any kind of clothes on any level of difficulty. I have examples at home and may show them to my prospective students. I sell them often and my clients like my work. I am Russian by nationality but moved to the USA 9 years ago. 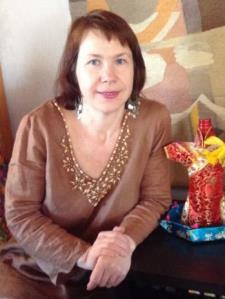 I was a teacher in Russia and the principal of a private elementary school. I used to teach elementary school students math, Russian, and English for four years. Right now I am a math teacher at the high school level but speak Russian at home with my family. I teach Russian classes at the Chesapeake College. I am a certified SpEd teacher for all school ages and I have 4 years of experience tutoring elementary school students. I worked for Princeton Review, Tutor.com and was very successful with it. I have MS in Electric Engineering and currently I am a certified teacher from KCHS and used to teach Discrete math in my school. I can teach my prospective students all kind of problems on Counting Methods, Probability of events and Algorithms. I can teach Praxis I and Praxis II ( middle and high school math) since I passed them with good scores. Now I am a middle/high school teacher with 6 years of experience and use different teaching strategies in my classroom. I have also taught Developmental Math at the college level for 2 years. My son worked with Alla for less than and month, and really got great results on the SAT. She did an excellent job explaining difficult concepts, and gave lots of good examples. Simply put, she gave my son the confidence he needed to succeed. I would highly recommend her to anyone with students needing that extra push to get ready for the national exams. Just started today but feeling very confident that Alla can help my daughter score higher on her SATs. Very kind soul. I look forward yo seeing my daughters next SATs. Very Knowledgeable and obviously likes helping students learn. Precalculus algebra and Advise on what to study for the SAT. She is very good at guiding when necessary and letting the student work until help is needed. I am very pleased with Ms. R. She has helped my daughter with her algebra tremendously and it really showed on her grade. According to my daughter Ms. R. really helps her to visualize and put them in contact with more practical ways, not just memorizing them. Ms. R. is not only a excellent tutor but also she is a wonderful person. I will recommend Ms. R. to any parents who are looking for help to fill the gap the school teachers may lack of with students.